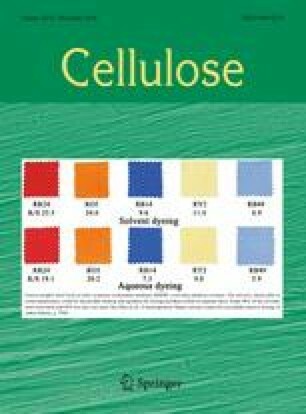 This study aimed to modify the surface of cellulose nanofibrils (CNFs) prepared by TEMPO-mediated oxidation via two approaches: esterification and amination for further reaction with activated bromocresol green (BCG) to prepare CNF-BCG composites capable of changing color to pH level. Both the esterified and aminated CNFs were reacted with the activated BCG to obtain the composites of CNF-BCG1 and CNF-BCG2, respectively. Then, these composites were exposed to different pH levels to observe any color changes. Fourier transform infrared (FTIR) spectroscopy, thermogravimetry analysis (TGA), and UV–Vis spectroscopy were employed to characterize the modified CNFs and CNF-BCG composites. FTIR spectra showed that CNFs have been esterified or aminated, and the modified CNFs had been successfully reacted with the activated BCG to form CNF-BCG1 and CNF-BCG2, respectively. TGA results also supported this result with a greater thermal stability of both CNF-BCG composites than those of the CNFs. The CNF-BCG1 became yellow below pH 2 while it became green above pH 5. Although these CNF-BCG composites showed color changes to relevant pH levels, the CNF-BCG1 had more distinctive color changes than that of the CNF-BCG2. 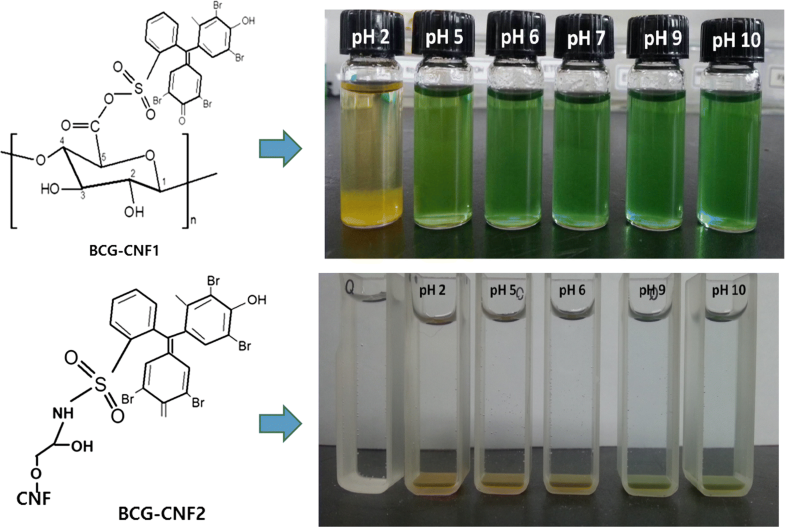 These results suggested that the esterification of CNFs was a better route to the reaction with the activated BCG for the color change, showing a possibility of using the CNF-BCG1 composites for colorimetric application. This work was financially supported by Kyungpook National University Bokhyeon Research Fund, 2017.